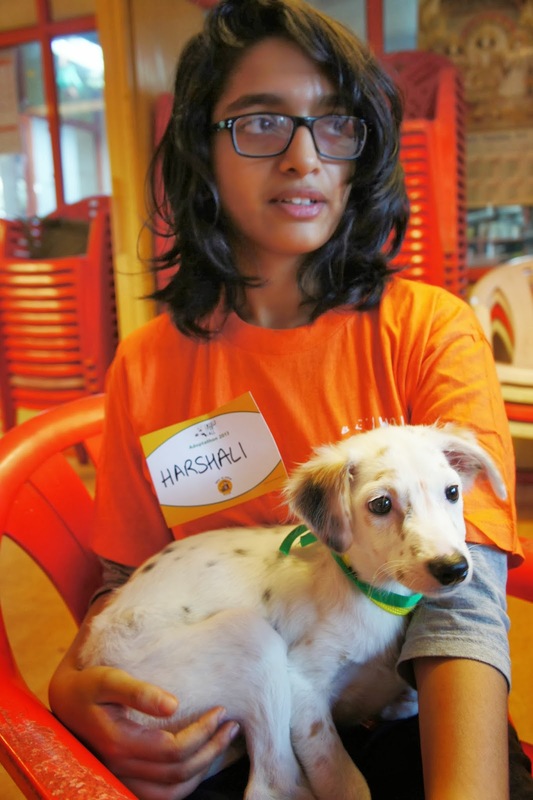 Last Saturday morning, after sturdying myself with a nice sneaked-through-customs-Waitrose-bacon bap, I had taken myself off to the World for All Animal Adoptathon in Bandra. Minus Mr Jules. And just to have a look you understand. I had seen lots of pictures on Facebook of cats and dogs needing homes - so just paying my 50 Rs entrance fee would do good right? As I entered the room (packed with people and animals), I saw a man holding a white puppy with black spots and for some reason, immediately felt disappointed. Someone had already adopted that gorgeous dog? (But that's OK, because I was just there to have a look remember?). I went up to the man holding the spotty dog and started to stroke him (the dog not the man). The man - a big fella with a booming voice told me that he was just cuddling the dog and that he was still available if I was interested. I said "who me? no I'm just here to look at the animals!" Within a second he had plonked the puppy into my arms and told me that I would make the perfect mum. Well who was I to argue? Without hardly any hesitation, I said I wanted to take him home. I was then interviewed to make sure I was a suitable human (hmmm) and asked to fill in some paperwork. Although he obviously has some Dalmatian in him, my puppy is fore-mostly a street dog (Pariah). So I was given specific instructions by the adoption centre on how to raise him. And expecting to just feed him some regular Pedigree Chum puppy food, I was told to give him boiled egg, dhal or yoghurt or chopped liver and rice. What??!!! It was all becoming a bit daunting but then I had to remember that most people in this city can't afford 'proper' dog food - they just give their pets whatever they are eating. 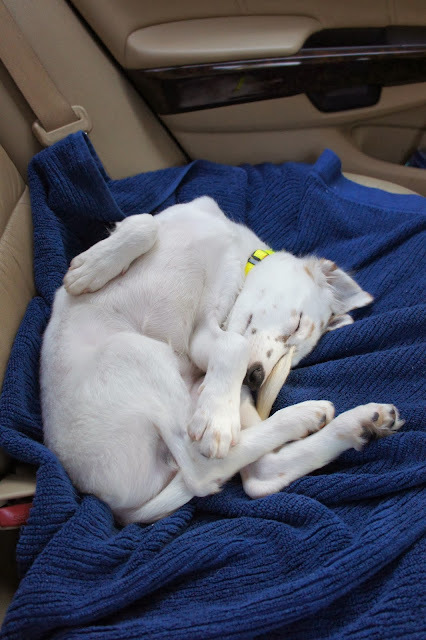 Within thirty minutes of arriving at the centre, I was leaving with my pet puppy. Mr driver looked very surprised when I walked out with this small, spotty bundle in my arms. Thankfully, Mr Jules was remarkably calm when I walked through the door of the apartment - he kind of knew what the outcome was going to be as I left the house that morning. We named him Bartlet Bindi - after President Bartlet from Mr Jules's favourite TV series, The West Wing and the fact that he had an orange Bindi on his forehead when I received him. After this, things started to go a bit downhill. Within two hours of getting him home, Bartlet started throwing up. He did not stop. Then he had diarrhoea all over the place, staining a rug in the process. 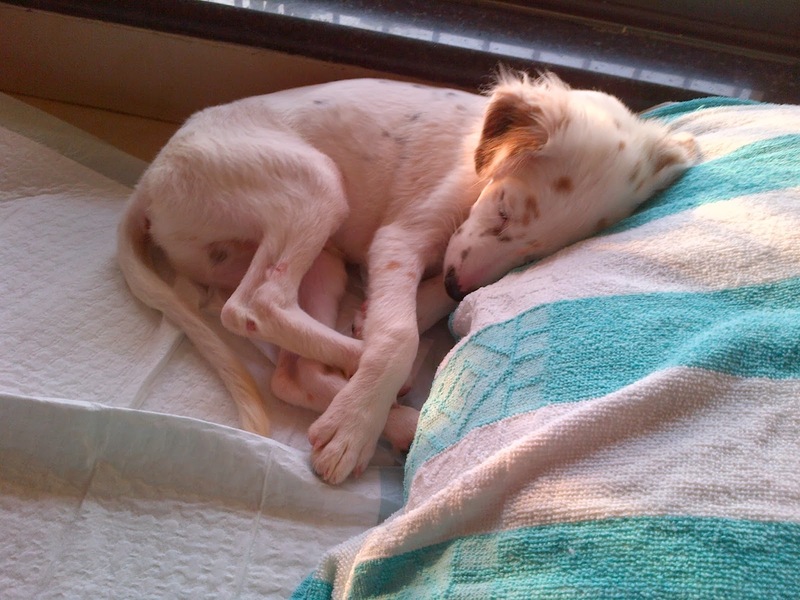 We just put it down to nerves and being shifted to a new home and hoped that he would be better in the morning. 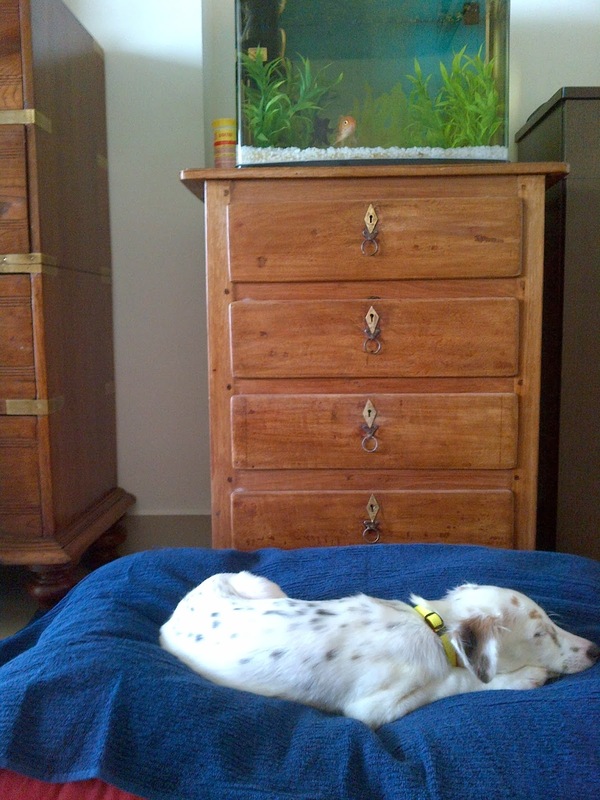 Bartlet when he was weak and sick on the second day. Heartbreaking! But on Sunday, we woke up to find that he had messed up his dog bed pretty badly and he was still vomiting. What's more we couldn't get him to eat. I rang World for All to complain that they had given me a sick animal and didn't know what to do. They apologised profusely and told me that his twin brother - who was also at the adoption centre was also very sick with dysentery. Therefore it made sense that Bartlet had the same. 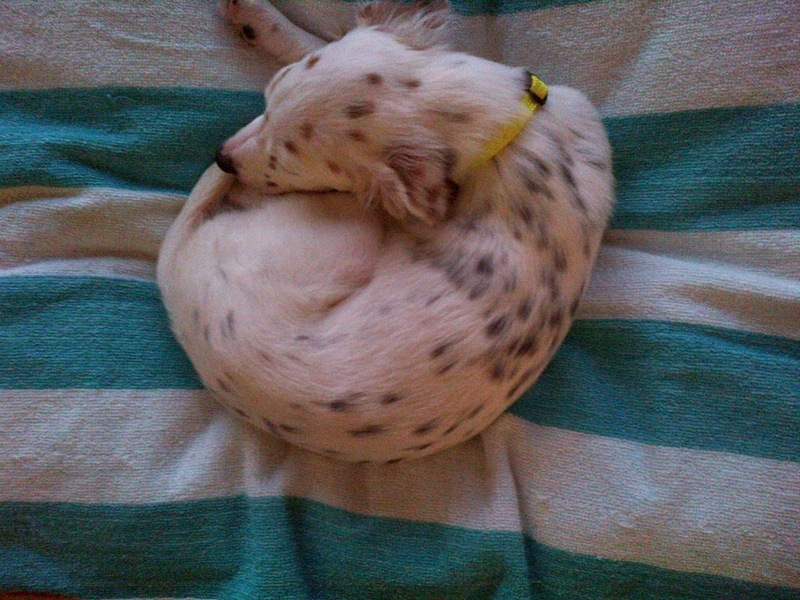 Unfortunately it had only become evident that morning and the dogs' previous foster parents had already done a runner. Great. 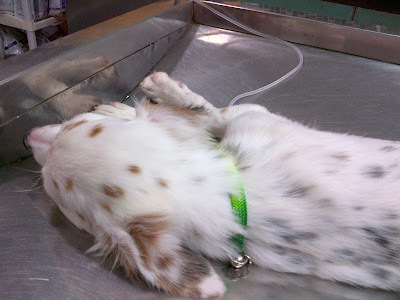 We immediately took Bartlet to a vet (provided by World For All) who, after an initial inspection, looked very concerned and put the dog straight on a drip. Barlet was severely dehydrated. The vet then told us that he suspected 'parvovirus' - a viral infection that is 'terminal' (I did not find out until later, that this is not, strictly true - it's quite treatable providing it has been caught early enough). Of course, I started to cry then - there was no way I could deal with a terminal patient. Bartlet at the vets on an IV drip. The vet gave him some anti-biotic injections and we got Bartlet home. He slept for virtually 24 hours but with less incident during the night. The next morning, I took him to see the vet again, who seemed pleased with his progress but gave him another IV drip and some more injections. Bartlet was strong enough to fight against the insertion of the drip - so it was obvious he was very much better. From then on in he improved very quickly. Yesterday, we woke up to a very bouncy and over-excited dog. I took him to the vet again yesterday for one final time. The vet gave me his final diagnosis of not potentially fatal Parvovirus - but severe food poisoning coupled with a change in environment. Thanks a lot for the scare! I am pleased to report that Bartlet is now 80% of the way to being well - he just needs to rest a lot now. He has already commandeered the sofa! This is my seat now! Bartlet has OCD! Every time you give him anything - be it a doggy treat, a toy, his ball or a rag - he tidies it away to his dog bed! Getting on with the fish like a house on fire. Stay tuned for further tails tales! Ohhhh... I'm so glad you didn't take T to the World For All last year when she was visiting you!! I don't think Buffy would have appreciated another canine companion to share the couch with... Bartlet looks very cute. I'm sure you'll get on fine. Keep well and keep those stories coming. Thanks Andy...he already has me wrapped completely around his little paw! Hi again, saw recent photographs of Bartie on your blog ; one, when you visited chapel. He has really grown big & looks sho shweet! Hello Poonam. Sure no problem - please can you email me on bombayjules@gmail.com then we can exchange info and I can send you photos. Thanks for getting in touch! So happy to hear he is doing well.....he is adorable!! Just perfect for you!! Hello Lisa, fancy meeting you here! Hope you and the family are well (and your neighbours ;) Bartlet is definitely better, and as I discovered today, brilliant at travelling by car. Have a lot of fun with the newest cute addition to the family! This is such a heartwarming story. 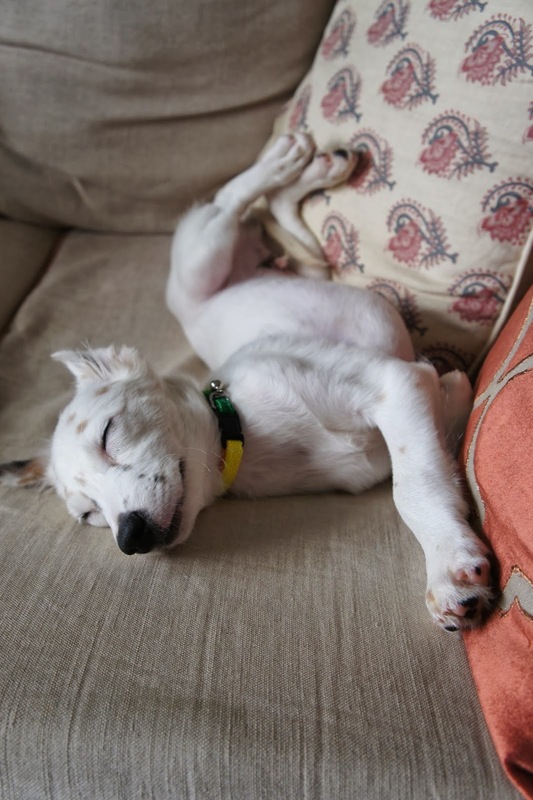 I am glad little Bartlet found a home and he does seem to have taken to the couch so well. I have a little Walter (daschund) I got a year back from a farm in Lonavala. He was the most frightened little pup you would have ever met. I have been working with him everyday to make him braver and less nervous. Each day I take one step at a time. The most rewarding thing is to be woken up every morning with his sweet face nose to nose staring at me. Without fail- he is by my side. Enjoy being a doggy mommy. That's me in the second picture ! I hope he's doing well now :))and this is a great post btw! Well hello Harshali! He is so well now and becoming very boisterous and big! But he really is a treasure...thank you for all the volunteering work you are doing for World For All. would love to read more happy tails..
Hope the lil bugger is all fine now..your blogs are great! lived 27 years in this city and never looked at it the way you do...looking forward to some great posts! Hey Sharmista, welcome to BombayJules...thanks for your lovely words! Bonus - fab looking Bartlet Bindi!!!! As a fellow adopter of a street dog (mine has mixed dachshund, street and Pomeranian blood in him) I can tell you that they're actually a very hardy breed (?) I've had my dog, Scotty, for eight years now and the on only time I saw him throw up was when he ate too much. I think it's great that you adopted a street dog. People here seem to prefer the more attractive foreign breeds, sadly.